A new alpha build came last night, and although there’s few changes to Mistweavers, Monks have gained two new races. Here’s a small recap on the things that concern Monks! Song of Chi-Ji now has a cooldown of 30 sec, up from 15 sec. Not many changes to Mistweavers, but it seems that Blizzard haven’t quite gotten to the healers specs yet. The damage classes and specs have first priority, and we’ll probably see the healer changes coming soon. New information on the Allied Races is trickling down the alpha mining. Two of the new races can be Monks, so here’s a small summary of the races and their racials. I’ve done a small update on my blog and added new images of my current UI on the UI Inspiration page. 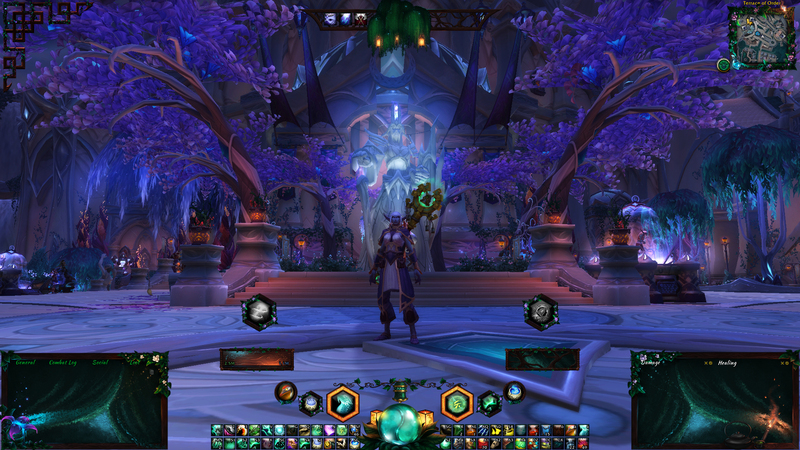 Sakresse has also obliged with new and sparkly images of her Legion UI! I want to keep filling the page however, so I will need your help! 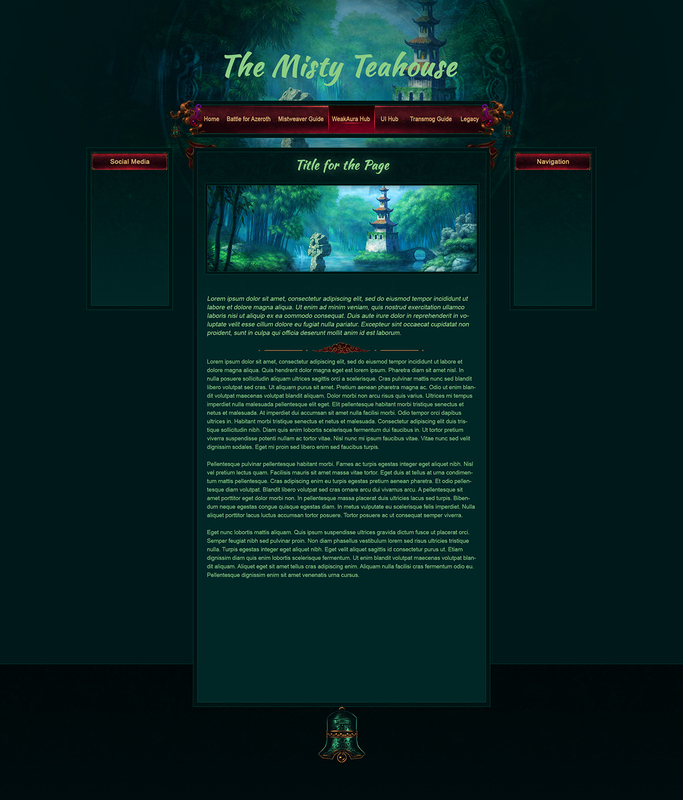 I’m terribly slow at updating my blog pages, I know, but I’m getting there. The UI Inspiration page has gotten a small update now at least. I’ve added my own and Sakresse’s UI, and my Patreon interfaces. You can get inspiration from those and of course my old UIs. Morning, dear readers! I am currently knee-deep in my Patreon work, so I haven’t been able to update the blog until now. There was a new alpha build a few days ago (though it took awhile before data diffs appeared), and here are the mistweaver changes! Renewing Mist now heals for 600% of spell power, up from 500%. Vivify now costs 2.5% of base mana, up from 2%. Rising Sun Kick now costs 2% of base mana, down from 3%. Spinning Crane Kick now deals 400% of attack power damage, up from 159.8%. Rising Sun Kick has reverted to its old cost, bumping up the relevance of Fistweaving 2.0 slightly. Spinning Crane Kick has had a serious buff that partly addresses the problem with leveling that I mentioned in the previous post. Some of the other class halls have had a few updates, but we have yet to see that in the Monk Class Hall. Hopefully, we’ll get some more Monk-themed interior. It is still very much the same as when you level a Pandaren of any class. But we’re still in alpha, so there is lots of time for updates still. Speaking of which, Blizzard has now released all classes/specs on the alpha, all dungeons heroic/mythic, and almost all zones. Max level has increased to level 110 on the leveling servers. We’re getting closer to a beta, I believe. I Cheat with Holidays – New Alpha Build! Even though I am 500 kilometres from where I live, high up in the mountains; currently in front of a cozy fire with a furry dog at my feet (snoring loudly, as well); I cannot completely abandon my blog work. Though I am a bit late! A few days ago, there was a new alpha build that I did not had time to report – but now I find myself with some spare time and think this is an excellent opportunity to go through the recent Mistweaver changes on the Legion Alpha. Glyph Zen Flight: You fly through the air at a quick speed on a meditative cloud. Revival heals allies within 40yds for 450% of Spell Power, down from 895%. Spinning Crane Kick now costs 2% of base mana, down from 1%. Effuse can now be used by all Monk specs. Posted on February 1, 2016 Categories Alpha, Legion, Mistweaver, WoWTags holiday, update8 Comments on I Cheat with Holidays – New Alpha Build!